Great boots ever. It is waterproof, light and cute. Literally everybody who see my boots asks where I get these. - I read the reviews and ordered the wide but they are still narrow and I ordered a 9 instead of an 8.5 and they are snug - wish I ordered the 9.5. They are nice looking and waterproof - a little stiff - hoping they soften up . The style is a 5/5. It's great how lightweight it is, but overall comfort is a 3/5. For the price, I expected more. The sherpa at the ankles makes it look so cozy, but the inside isn't cozy at all. It feels kinda hard/rigid. It's lined with some super thin fabric that doesn't provide extra warmth. This is something I would have expected from a cheaper brand to do to reduce cost. Bummed that I don't get to wear them when it's very cold. What an awesome boot! I have had the other Zerogrande hikerboots (several pairs) for over a year so I tried this one. The shearling makes the inside incredibly comfortable. The fit is great, and I just love them. Fortunately I was out of town when we had snow and ice, so I don’t know how warm they are in winter precipitation. So comfy - didn’t even need to wear them in! Color looks great with jeans and black leggings. They are warm, lightweight, and such a great buy for winter in NYC. Love these boots - they are a bit tight so if you plan to wear thick socks with them, definitely go a half size up. Otherwise they're perfect for the chilly days of winter! 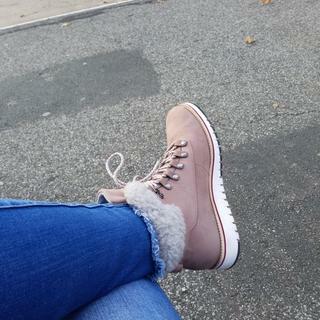 I love these winter boots. They are warm and comfortable plus I get lots of compliments. They stain after one use. I loved the boots, the color is beautiful and they are comfortable! I am usually an 8, and ordered them true to size, but when I used them with warm, thick socks they did feel tight. I had used them before with thins socks and I didn't see the problem there. Love these but definitely size up! I'm usually 8.5-9 so I originally went with a 9 since it's a winter boot. When I got them and tried them on they were surprisingly snug, even with a thin sock. I went back and exchanged for a 9.5 and they are perfect! Never usually bigger than a 9 so I would definitely say these run small. These shoes are amazing, very warm! I love them. These shoes are both comfortable and sleek. They are true to size and super comfortable. Would recommend. I was so surprised by how light these are! They are also very comfortable. I have not tried them out in the rain as I'm afraid I will get them dirty. I guess we'll see about this when I wear them in Tahoe. I believe I'm a true size 7 and I purchased size 7. They fit well and have enough space to wear thick socks. Having to return these as the arch (?) was too high and made the top of my foot hit the tongue of the shoe. They were very beautiful in person. Great shoes! I wear size 8, ordered 8 and they fit perfectly! Love love love. Cute and waterproof. Stable. Comfortable. Good for a soccer game or a day in the city. LOVED the look of these boots but they ended up being too small and narrow. I am usually a 9.5-10 and originally ordered the 9.5 based on a lot of reviews saying the shoe ran big. Currently waiting on a size 10 in the mail. Hopefully they fit! Very stylish and I love that they are waterproof. because my daughter sent me the link and the cyber Monday deal! Going to Tahoe for Christmas! Stylish AND functional, and hopefully comfy!! Looks beautiful and comfy . Great for winter trips to mainland , and to keep my Island toes warm and stylish even in urban walks while wearing city clothes. This is a really beautiful and functional shoe. Cole Haan tends to run narrow, so It's great that it comes in wide. This shoe goes great with jeans or leggings and dresses up a casual look. It is such a nice color and fits so perfectly. I have other Zerogrand shoes and they are the most light-weight and comfortable shoes I have (not to mention stylish). I like looks of the boot and I received an email from affirm but when I clicked on affirm at checkout It did not work. This is for a gift. I live in Rochester and it gets very cold here. This seemed to be a perfect fit for the snow . I need something that keeps my feet warm and look stylish too and this pair fits both. They look perfect for walking around New York City at Christmas! I have a long walk to my building at work and often need to walk through mud, puddles, etc. Hoping these boots can get me through the winter months and in style. Feminine, stylish, and functional. I can't speak of comfort or overall wear quality as of yet but they are light and look well-made. Zero grand comfort and waterproof--great combo! Fashion, function, and all day comfort, just what I need for the cold weather. I will need these boots for a cruise to Iceland and Greenland. Needed something waterproof and warm and in a wide size. Have bought from Cole Haan before and I like the quality of their shoes and boots. How good is it in the snow? I'm going to Hokkaido in Dec and wanted a stylish boots that I can wear in the snow. But afraid the sole does not have enough lug to it to walk on icey surface? BEST ANSWER: This hiker-style boot will keep your feet toasty and dry in cold weather and the textured sole provides good traction on hard, dry surfaces. I find these boots to be a little narrow. How much wider are the C width? Is it a big jump in width. I wouldn't want them to be clunky. Are there faux fur fleece or real lamb shearling lined? BEST ANSWER: This style features genuine shearling accents. I believe it's real shearling, I checked the fur is from sheepskin, I can see the pores underneath. The Shearling is covering only the outside ankle part of the shoes, and the inside is lined with fleece fabric, very smooth and comfortable material. BEST ANSWER: No, but they have a low-pile fleecy fabric lining along with shearling collar and tongue. Pair these boots with a nice warm boot sock and you're good to go! BEST ANSWER: The weight can vary slightly by size. For example, size 6.5 weighs approx. .95 lb. for 1 boot. are they heavy like timberland? BEST ANSWER: No, not at all. They do require a little breaking in for a few hours, but the actual boot is super comfortable and lightweight. No, they are much lighter. Not as light as sneakers but I think you would be pleasantly surprised. Oh no. They are much lighter. Wore them all day on Thanksgiving without issue. Also, these are waterproof unlike timberlands. No, they are very lightweight yet very sturdy and comfortable. No, they are very lightweight. No. They are very light! I just got these shoes in the mail and they squeak every time I take a step. Has anyone else had this issue? Does it go away with wear? BEST ANSWER: Yes my boots squeaked too. I wore them one full day (at home) and NO MORE SQUEAKS. I love them! So light and comfy and squeak free now. Smiles!! Yes, I wore it couple of times already. These shoes are amazing and very warm! It's just the new sole squeaking, so just give it some time. I’ve worn mine a couple of times now and I haven’t noticed this at all. Maybe try exchanging for a different pair? I just got them. Haven't worn them around the house much yet but haven't experienced that issue. I had a very minor "squeak" for maybe the first six steps, then gone. Is there anything I need to do to protect the mauve suede fabric before wearing these boots in the snow/rain? BEST ANSWER: It appears the boot is waterproof. It is nubuck, unlike suede, it will weather the elements. Plus, Cole Haan has the very best guarantee of their products. I would buy them and love them. Mauve will be beautiful and go w everything. Definitely need something to protect them and you’ll have to clean them a bunch. I wore these in the snow in Tahoe. they turned out great! Has anyone had problems with Boots squeaking? BEST ANSWER: I have three pair and I haven’t heard any squeaks. I have a few pair of boots that do squeak, but these seem to be silent. Hope that helps! Is the shearling padding collar detachable on the hiking boot? BEST ANSWER: the shearling padded collar is not detachable. No, the shearling collar is not detachable. Would I be able to fit bootcut jeans over these? BEST ANSWER: I did not end up keeping these (didn't fit me well) but I'd think you could fit boot cut jeans over them. But the top of the boot is so cute I think you'd want to wear something you can tuck in the boot. Just my opinion. Definitely. I wear these with straight legs and I don't have a problem. Sure! But they're so cute why cover them up? How can I clean or protect Women's ZERØGRAND Explore Waterproof Hiker Boot? BEST ANSWER: . For suede footwear, wipe to remove dry surface soil, then buff with a suede brush or bar to restore nap and minimize markings. Occasional application of suede protector will help. They don’t need protection- my boots look brand new after walking in rain and mud. Just brush them off once they are dry. I love these boots. You can buy a really great spray protector for it. Do you recommend a spray in particular ? I bought the protective spray that Cole Havan sells. How do I clean these boots when I get a salt ring after the boots dry? BEST ANSWER: For suede or nubuck footwear, wipe with a soft, damp cloth to remove dry surface soil, then buff with a suede brush or bar to restore nap and minimize markings. Occasional application of suede protector will help. but they are still narrow and stiff. Will they get softer and more comfortable as I wear them or should I return ? BEST ANSWER: If they are uncomfortable now, you should return them for another size or credit. This style may not be a good fit for the shape of your foot. My boots started leaving blue marks, it looks like denim dye but my jeans haven’t been over my boots. Any ideas or what I can do to get the marks off? BEST ANSWER: This style has nubuck uppers, so you should be careful what you use to clean it. We recommend using a suede bar or brush to try to lessen the look of scuffs/stains. Rub lightly to lift the nap. Avoid using any liquid cleaner on suede or nubuck.